Highest quality premium river jig available in 5/8 oz, 3/4 oz and 1 oz sizes. These jigs are designed for fast current situations where contact with the bottom and quick hook sets are a must. Super sharp Gamakatsu hook and level swimming action will help increase your hooking percentage. 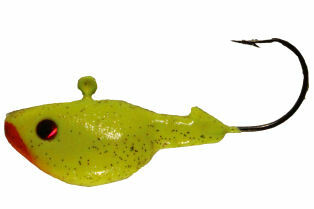 These are the same jigs Lance Valentine uses on his Detroit River charter trips. 3 pack.